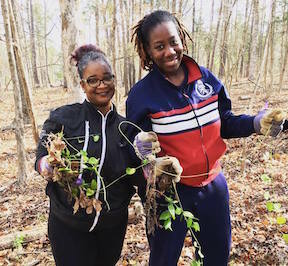 Our stewardship staff works alongside dedicated volunteers year-round to protect natural ecosystems and increase access to natural spaces in the Eno River Basin. We work to protect Association owned conservation lands, as well as those owned and managed by our conservation partners, such as Eno River State Park and the NC Plant Conservation Program. We need volunteers to achieve our stewardship and conservation goals! Strengthen your connection to the great outdoors! Stewardship Workdays – Get outside with us and roll up your sleeves to help protect the mighty Eno. Common activities include invasive species removal, litter clean-up, and trail construction and maintenance. Join our email list to stay up to date with upcoming opportunities to get involved in Eno River stewardship. Our volunteers make a huge difference! Click here to subscribe! Eno River Trail Stewards Program – The Eno River Association, Eno River State Park, and West Point on the Eno City Park have partnered to invite trail enthusiasts to assist park staff in trail maintenance. As a trail steward, you will adopt a City or State Park trail section to visit monthly, monitor for any issues, and perform routine trail maintenance. You would first be required to attend a training session, which is typically held in March. Click here if you are interested in becoming a Trail Steward! NEW! 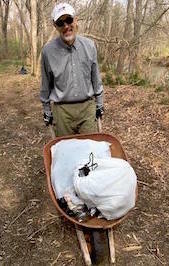 Eno River Site Stewards Program – We are looking for volunteers to join a Site Stewards program, modeled after the Trail Stewards program. You would first be required to attend a training session before being assigned to an Eno River Association property to help us monitor and enhance the habitat throughout the year. We hope to host a training this fall, if there are enough interested volunteers. Click here if you are interested in becoming a Site Steward! Corporate Workdays – We welcome local businesses to donate their time to help us during the work week. 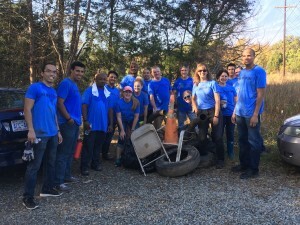 This is a great opportunity for team-building and achieving your business’ philanthropy objectives, while helping us complete stewardship projects. We thank Burt’s Bees and Biomerieux for volunteering their staff time! Email corporateworkday@enoriver.org to get started. If you have any questions or want to learn more, please contact Stephanie Panlasigui at (919) 620-9099 ext. 206, or email Stephanie@enoriver.org.